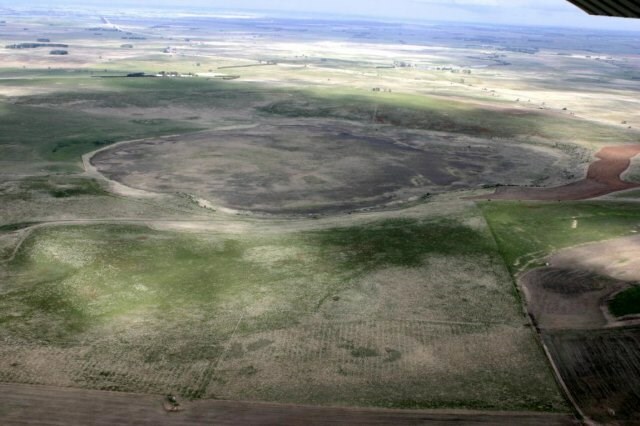 Stockyard Hill is the largest single volcanic feature in the South Beaufort area, which is part of the Western Volcanic Plains that stretch from Melbourne to the South Australian border. It is estimated that this volcano formed between 100,000 to 500,000 years ago. Hot magma from the earth’s mantle builds pressure, and eventually bursts through the earth’s crust as a volcanic eruption. Lava Flow: The magma breaks through the earth’s surface through a crater or fissure, and the magma then flows across the surrounding land as lava. Lava Flow volcanoes tend to be fairly broad gentle rises. Lava Flows can build up as they flow, forming Lava Shields and Lava Tubes. Scoria Cone: The magma is expelled forcefully into the air, along with rock (eg basalt), ash and various gases. When this happens, the expelled material falls around the crater, forming a steep cone. Maar: The hot magma breaks through the earth’s surface and immediately comes into contact with water, resulting in shallow steam-driven explosions. A maar tends to be a very broad crater with a low rim, sometimes forming a lake. Scoria: This is basalt rock that has been thrown up in a forceful eruption and has solidified upon falling back to ground. These rock fragments have been aerated with the volcanic gases, forming Vesicles (gas bubbles) in the rock. Scoria is quite light and the colour can range from a pinky-red to a dark blue-grey. Spatter: Like scoria, but the lava is still hot when it hits the ground, so it sticks together as a welded mass. Tuff: This is ash and fine rock fragments that settle in sheets on the surrounding land. An initial maar-forming eruption that produced a wide, shallow crater, rimmed by scoria and tuff. An explosive fire-fountain phase that built up the higher rim on the northern side. A substantial lava flow that had a significant effect on the surrounding land, particularly to the south and the west. It is estimated that this basalt flow is approximately 60metres in depth. Foundering of the vent during or subsequent to the lava eruption to produce the well defined circular inner crater with steep lava walls. The inner crater now contains a shallow, intermittent lake – this is known as Black Lake. This lake dries up in extended dry conditions. In order to log this earthcache as a find, you need to answer the following questions and email or message them to the cache owner (chooknchunk). You may go ahead and log this cache immediately however you need to submit your answers within a week of logging. Logs that are not backed up by submitted answers will be deleted. Q1. Standing at the posted co-ordinates (which is on a small rise only a few metres from the roadside), you should be able to see Black Lake, or it’s basin if it is dry. Was there any water in the lake at the time of your visit? Please describe. Why does the water level change?